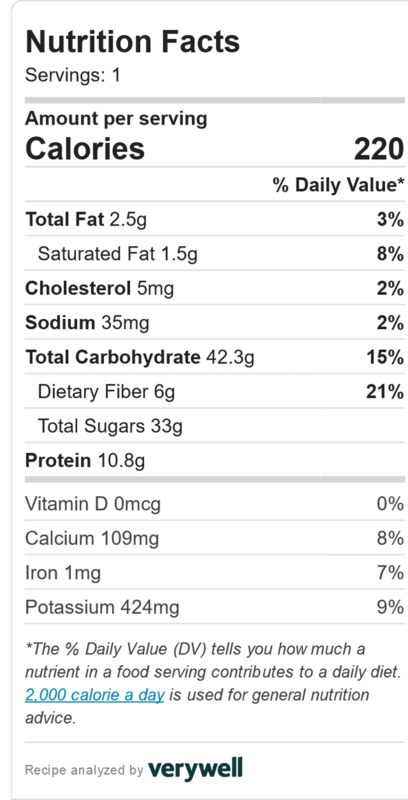 Who’s ready to try a spicy apple green tea smoothie? Whether you’re on a diet or making healthier changes to your lifestyle, green tea is probably on your radar. I’m not so much a hot tea person, but I make a lot of iced tea in my Mr. Coffee Iced Tea maker, to keep iced tea in my fridge year round. Usually I buy green tea, but flavored green tea. Whether you’re looking to burn fat, lose weight, or reduce your risk of some chronic diseases, make green tea a new habit. I drink a few smoothies a week, usually for breakfast or lunch. Sometimes a dinner substitute. My chocolate butter peanut butter banana smoothie makes an appearance as dinner on Monday nights when I head to the pool for deep water aqua fitness class. Though I could just as easily switch it up with the spicy apple green tea smoothie. The point is not to hit the pool or exercise after eating a meal, so a smoothie substitutes nicely for dinner. I usually keep apples in the house. 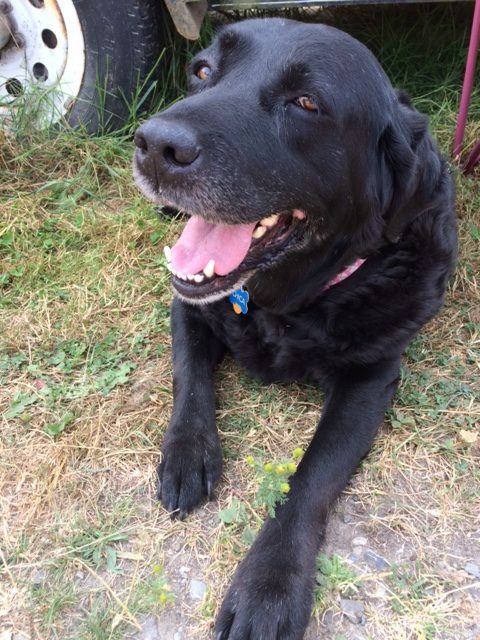 My black lab, Chica, eats at least one apple a day as part of her high fiber diet. If I’m at the grocery store I buy the best deal in bagged apples for Chica, and then I buy a bag of apples for myself. 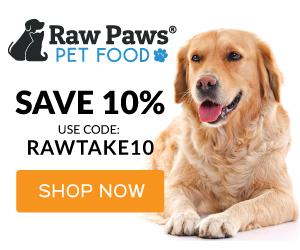 If they start to turn before I eat them – Chica will still eat them! She’s such a little sneak. 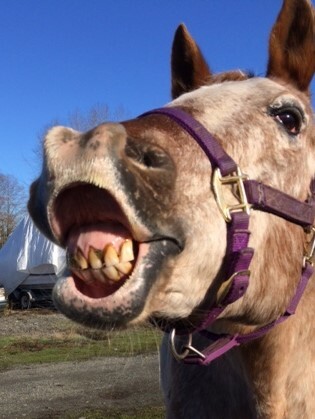 If I bring apples for my horses, she’ll steal them! The horses are not impressed. My apple preferences tend to run to firm, tart apples. I usually buy Granny Smith or McIntosh. Right now I have pink lady apples in the fridge. 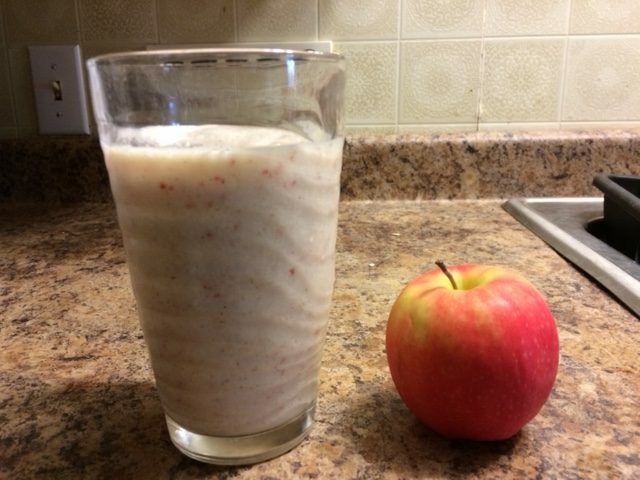 To make the spicy apple green tea smoothie, you need one apple, sliced thin. It doesn’t matter what kind of apple you like. I leave the skin on my apple. Extra fiber! It makes a chunkier smoothie to drink. 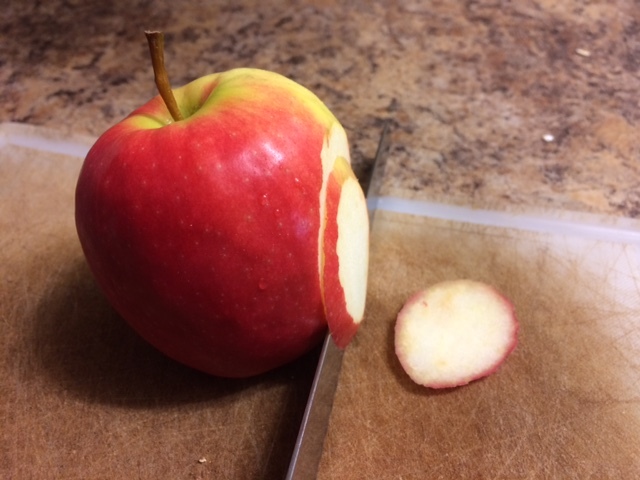 If you don’t like chewing apple skin in your smoothie, then peel your apple first. Toss the slices into your blender. Any blender you have that can grind up ice will work fine. One of my friends makes smoothies daily at lunch time and loves his Ninja. I’ve been making so many smoothies lately, I’m thinking it’s time to get me a Ninja too! And I always thought ginger was mostly for stomach and indigestion issues. It blends in pretty good with the spicy apple green tea smoothie! It’s not overpowering. Unless you choose to add more ginger. Chop up a teaspoon or so of ginger and put into the blender. 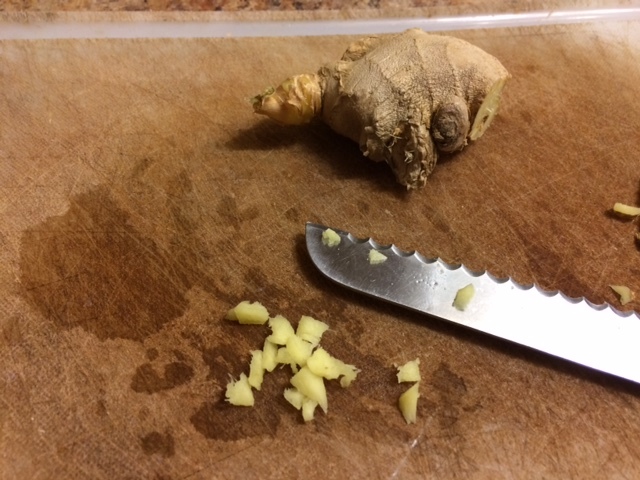 You could substitute dried ginger if you keep the spice on hand. Oddly enough I do keep it in the cupboard for making gingerbread. 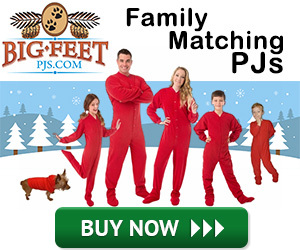 Which I didn’t do this past holiday season. I’m also thinking it might be time to give that spice the old heave ho and buy fresh ginger powder. I sprinkle in cinnamon, at least a quarter teaspoon, but adjust to your taste. Then put a teaspoon of honey into the blender. Fortunately those apple slices are already in the blender. Use them to wipe the honey off the spoon. You can add more or less honey to your taste. Add a quarter cup Greek yogurt into the blender. I keep vanilla Greek yogurt in the fridge, because I like to top off my chocolate chip peanut butter oatmeal bake with it. You could use plain yogurt or experiment with other flavors if you like. It doesn’t have to be Greek yogurt either. Just go with the flow. Whatever you have on hand. Then pour in 1 cup of iced green tea. Add 4 or 5 ice cubes, and put that blender on high for at least 30 seconds. 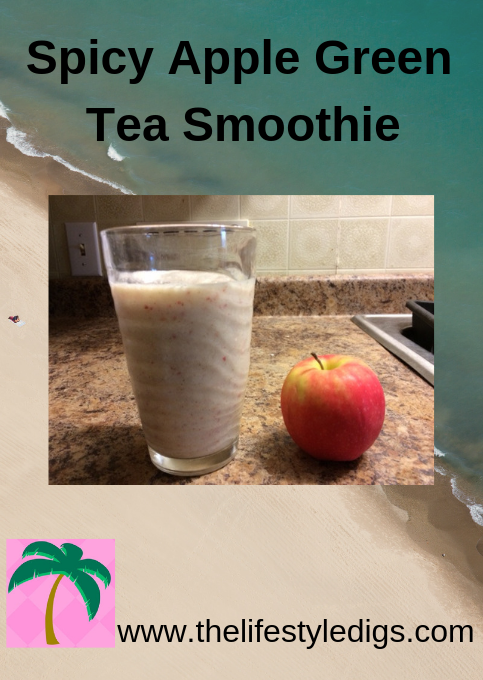 The Spicy Apple Green Tea Smoothie is a refreshing drink that you can really sink your teeth into if you left the apple peel on! Add a muffin or granola bar and call it a meal. Put all ingredients into a blender and blend on high for 30 seconds or longer until your desired smoothie consistency is reached. ← Is Buying from the Bulk Bins always the Cheaper Option?